An innovative supplement from the A-list’s go-to Beverly Hills-based skin care guru, these ultra-pure, vegan omega-3 capsules promise to boost your skin’s glow while supporting cardiovascular and immune health. Containing a month’s supply of easily absorbable ‘softgel’ capsules, this jar of genius is brimming with the fatty acids that are renowned for making skin softer, plumper and more hydrated. Just two capsules a day will leave you looking (and feeling!) unrecognisably radiant. 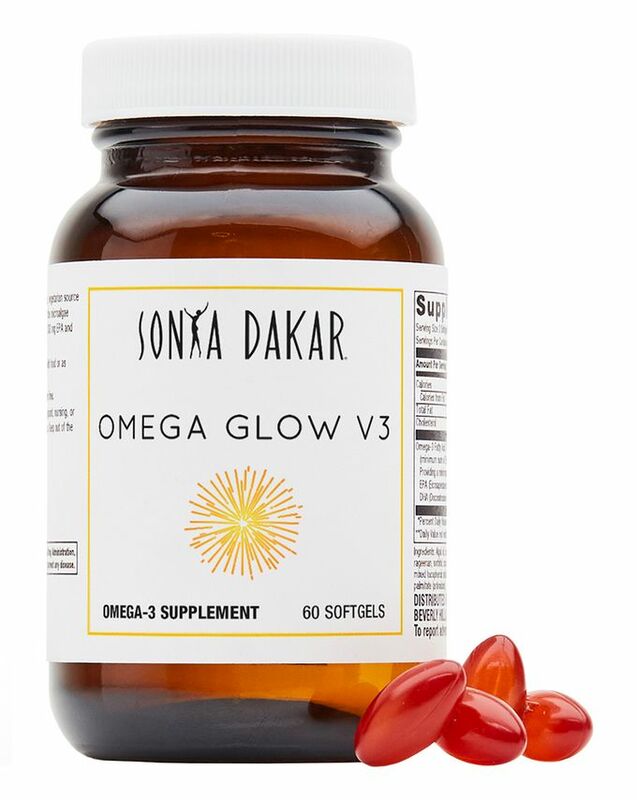 Sonya herself says “I have developed a wide variety of products infused with Omega-3. Seeing the external benefits of Omega inspired me to develop an internal solution— Omega Glow V3. It was essential for me to introduce a product suitable for vegetarians, vegans as well as those observing Kosher and Halal dietary standards. It took some effort to source a product that that was both vegan and pharmaceutical grade, though it was well worth it”. Full of fatty acids, omega-3 is renowned for its significant beneficial health effects – it’s been shown to support healthy brain and cardiovascular function while also enhancing skin’s radiance. Featuring a concentrated, purified, vegetarian source of pharmaceutical-grade omega-3 fatty acids, Sonya Dakar’s super supplement promises to give you gorgeously glowing skin from within – as well as reducing inflammation, enhancing cognitive function, alleviating menstrual discomfort, reducing symptoms of anxiety, improving bone and joint health and supporting cardiovascular health (we love can’t say no to a multi-tasker!) Free from gluten and non-GMO, this vegetarian-derived omega-3 source is also thought to be purer than that derived from fish oils (which often contain high levels of impurities and contaminants that have to be removed), so it’s perfect for the health-conscious out there. Delivered as easily absorbable ‘softgels’ Omega Glow V3 is a perfectly effortless way to give your beauty regime a brilliant boost. This product is non-GMO, vegetarian, and gluten free. After a week, my skin is not dry and dull anymore. It glows and looks healthy. I have been working long hours and not sleeping well and this product is exactly what I needed.